Why should you shop at Rouse’s Supermarkets? Surely one chain store is equal to another, right? In a word, no. Where else will you find crawfish-stuffed mirliton halves? Not at Winn Dixie or Fresh Market or Whole Foods, and certainly not at Wal-Mart. 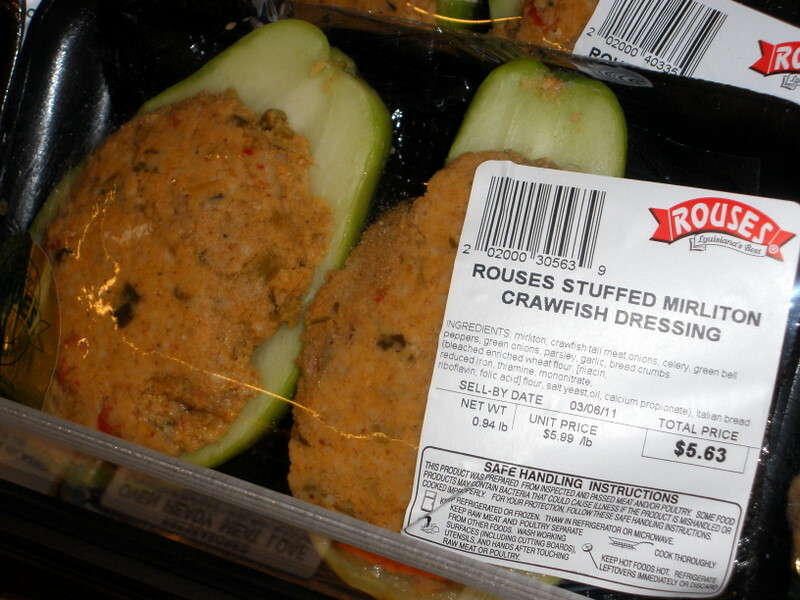 Rouse’s is still locally owned with roots in the bayous of Lafourche & Terrebonne parishes, so the stores’ grocery offerings often have a Cajun spin. Look for fresh sausages, smoked sausages, stuffed meats & poultry, boiled seafood, live crawfish (in season), wild-caught Gulf shrimp & Louisiana oysters, in addition to the usual supermarket stock. 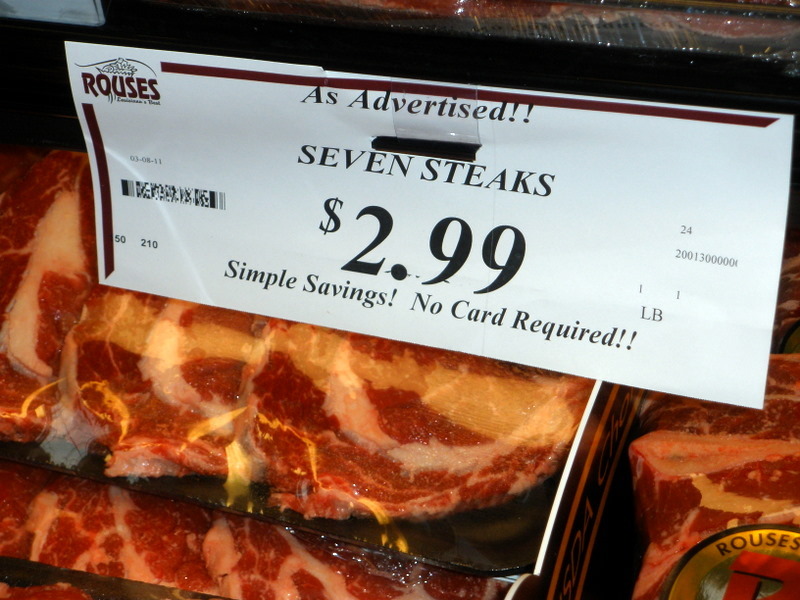 And when was the last time you saw a “seven steak” for sale? This cut, from the chuck region, was once common and is named for the shape of the bone at its center. The seven steak (or entire seven roast) is a chewy cut, best braised with onions, or used in a gumbo (see Paul Prudhomme for an excellent recipe), or cooked in the manner of New Orleans-style grillades. My favorite Rouse’s find? Fresh hog casings, sold in small packages for home sausage makers. One of my favorite things at Rouses is their chicken salad. It’s near identical to the one my grandfather used to make at Christmas time, which makes it the ultimate comfort food for me. I’ve never tried the chicken salad: chunky? ground? Eggs & pickles? I did sample the hot-lunch line offerings last week: white beans and fried fish. Ground with both eggs and pickles. I’ll give another reason why I like Rouses. My parents live in Lockport which even though it is amazingly small is an incorporated town. Rouses was by far the largest business in the city limits but they were outgrowing their store. They purchased land on the outskirts of the city limits. Then they petitioned to have the city limits redrawn in order for the town to keep collecting the taxes from their store. I doubt very seriously any of the national chains would have done that. Since we’re on the subject of Lockport, I heard a rumor that the small Frank’s supermarket south of town would be moving into the old Rouse’s space in the middle of town. I’d be surprised if both could survive–but hey, maybe Lockportians (Lockporters? Lockportites?) buy lots of groceries!